– Spine problems – especially Neck and Back Pain – are the most common physical complaints among working people. – Research has proven that sitting all day is one of the worst things one can do to their body, which people with desk jobs in a typical 9 to 5 schedule may find difficult to avoid. – Back pain ranges from a dull ache to a stabbing sensation. If left untreated, back pain can make it hard to move or even stand straight. – Guided Exercises, Rehab and Office Stretches go a long way in preventing postural discomfort and eye pain. Office Syndrome – is a common term used nowadays, to signify headaches, shoulder, back and neck pain, usually found in office workers who spend many hours in front of a computer or at a desk, working for long hours. Poor working environment, lack of movement, prolonged sitting influences these symptoms causing issues such as computer vision syndrome, postural discomfort – back, neck pain, etc. 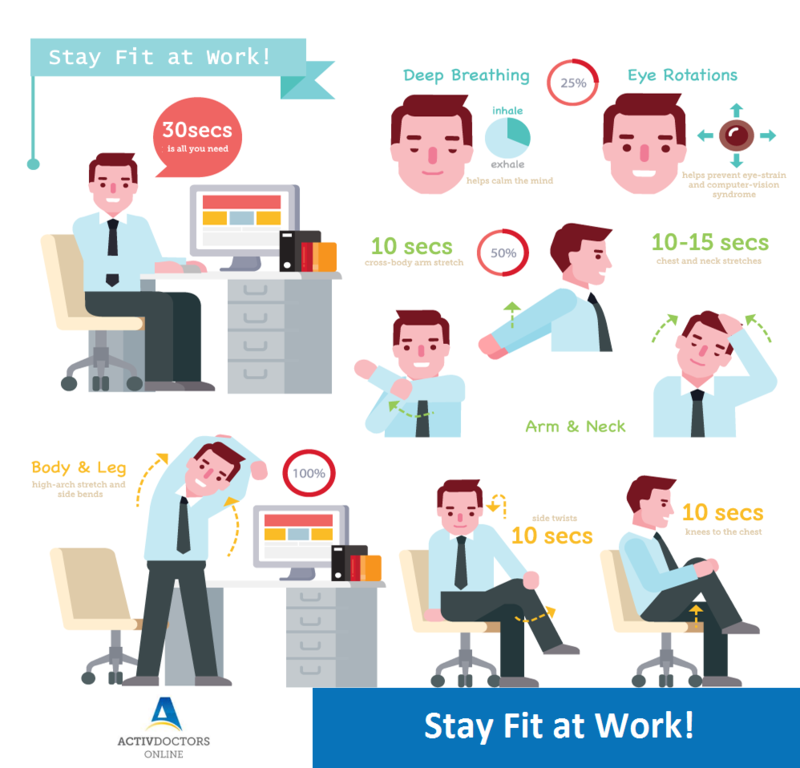 The good news is that staying fit at work, takes just about 30 seconds every hour. The following exercises and quick fixes will help you fight the mid-day slouch and improve your posture as well. Deep Breathing has shown to help calm the mind and provide instant stress relief. Eye Rotations along with the 20-20 rule helps prevent eye-strain due to constantly staring at the monitor and also prevent computer-vision syndrome. In seated or standing, bring your arm across your body and push your elbow inwards until you feel a stretch at the back of the shoulders. Bend your neck from side to side, apply slight pressure as though trying to get your ears to touch your shoulder. Neck Stretches and Rotations help undue strain in the neck muscles due to constant hunched positions. Inhale deeply and raise your arms above your head. Clasp your hands together with your palms facing upwards. Hold and exhale. Inhale again, lean to your left for a deep stretch of the right side of your body and repeat on the other side. • Hold your knee and try to pull it as close to the chest as possible. Hold, until you feel a slight tug in the back of your thigh and switch sides. • This is a great stretch for both your back and the hips. It is important to discontinue or not perform any exercise that causes you discomfort. In case you suffer from back, neck or shoulder pain and suspect your posture being a cause, it is important to meet a specialist to guide you with exercises and rehab specific to your condition. Early diagnosis and exercise shall help prevent future recurrences and the development of chronic issues by reducing the severity and duration of any episode of pain.